Hashtags are a key strategy for gaining followers and exposing your post to more people. But, do you ever feel posts look a bit spammy, cluttered and messy when they are accompanied by tons of blue links and # symbols? If you've ever wondered how to hide hashtags on Instagram to make your posts look cleaner and more professional, we can help you out. Make five dots: Sounds bonkers, we know, but just go with it for now. Type a dot, then press return. Repeat this five times. You should now have a lovely vertical line of dots on the left-hand side of your note. List your hashtags: On the next line down, start your list of hashtags. Because these will be hidden, you can add as many as you like, up to 30 in total as per Instagram's allocation. Copy it all: Copy everything on the note, including the dots and line breaks. How you do this will depend on your device, but a long press often brings up the copy option on most phones. Open Instagram and create your post: Load up your photo or video and write your caption for it. Do not include any hashtags at all at this stage. Post your post: Share your post with your followers. Add a comment: Click on the comments button for your post to add a comment. Paste what you copied from your text editor into this comment box, again a long press will usually bring up the option. That's really all there is to it. 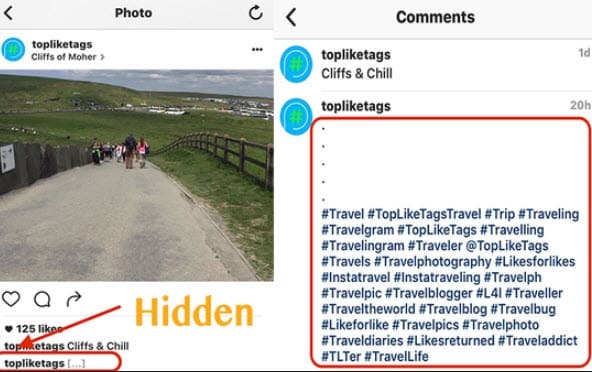 Now your post will be catalogued on all the relevant hashtag pages, but when someone looks at it, it will be just a clean photo or video with an uncluttered caption underneath. We promote our businesses via hashtags. Hashtags enable people find content they love, they help organize Instagram and make your carefully crafted posts more discoverable. Surely, we should be proud of them, displaying them as a badge of honor, not hiding them away? 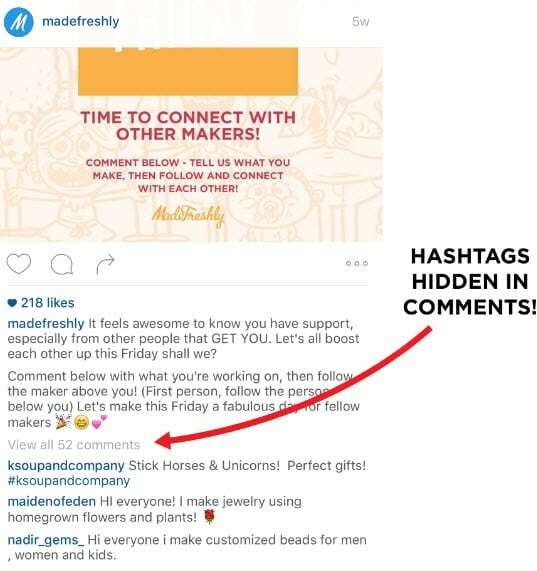 Many businesses see no point in hiding hashtags on Instagram, and therefore don't bother. Whether you want to or don't want to is really up to you, and a great deal will depend on your marketing goals, your brand and your target audience. To find out what works for you, make use of Instagram Insights and test a few different posts. And if you do need to squirrel your hashtags away, at least now you know exactly how to hide hashtags on Instagram.